A generation ago, getting old meant moving into a nursing home, spending your last years being cared for in an institutional setting. Not only was it incredibly expensive, many didn't find it particularly pleasant. So as the first wave of the Baby Boomers begin to think about their final years, an increasing number plan to live at home as long as possible. The trend is called “aging in place,” and it is practical as well as satisfying. Studies have shown people do better emotionally and physically in the familiar environment of their own home. It is also a lot less expensive. There are two prerequisites, however. The aging person must remain in reasonably good health and certain modifications may need to be made to the home to make it safer and easier for an older person to navigate. Since a study by AARP has found that 90% of people 65 or older expressed a preference to age in place instead of going to a nursing home or assisted living facility, builders and remodeling contractors have begun to specialize in elder-friendly designs. If you or an aging family member is selling a home, it might be wise to consider buying a new home that is designed and built with older occupants in mind. If you are aging in place in an older home, not designed to compensate for physical infirmaries, there are modifications that can make any more safer and more secure. Rodney Harrell, director of livability thought leadership for AARP, tells Forbes only 1% of the nation's housing stock currently meets the needs of individuals who are aging in place. In some cases it was a shortcoming as easily corrected as improving lighting. But it may also require more extensive modifications, such as widening doorways and hallways and providing a motorized lift to move from one level to another. Falls are a huge risk to the aging population so many of these design features are intended to keep occupants in an upright position. It starts with the floor they walk on. Old, thick carpet should be replaced with a surface less likely to cause tripping, such as tighter weave carpet or nonslip vinyl, rubber flooring and even cork. It's especially important in bathrooms, where most falls occur. The surface should provide cushion and traction. In the bathroom, bathing can pose real danger to older people who are unsteady on their feet. Ideally, an older person should be able to step into the shower without having to step over a barrier. If the bathroom is being remodeled, consider making the shower bigger, and designing handrails in key locations. In recent years walk-in bathtubs have become more popular features of a remodeled bathroom. Instead of having to step over the side of the tub, the bather enters through a water-tight door before filling the tub with water. Walk-in tubs usually require professional installation, but now most bathroom fixture companies offer one of these products. They also come with a variety of features, such as heated seats and water jets. Modifying doorways, making them wider, is another way to make a home safer and more functional for an older person. 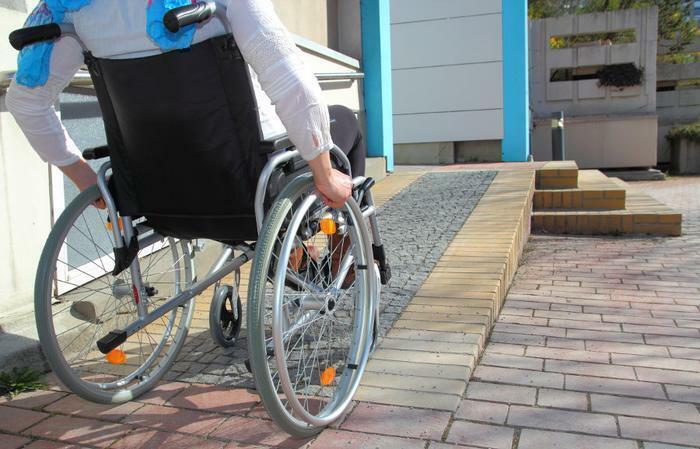 In the event the resident is confined to a wheelchair at some point, or must use a walker, it makes getting around easier and safer. It involves removing the old frame, or at least parts of it, and moving the door jamb a few inches to convert a 32-inch portal to one that is 36 inches wide. When replacing doors it also makes sense to replace door knobs with lever door handles. As people age they may have difficulty with gripping things. It is easier to open a door with a lever handle, much like you find on doors to hospital rooms. As a person ages, even a few steps can present a challenge, especially when a wheelchair or walker is involved. 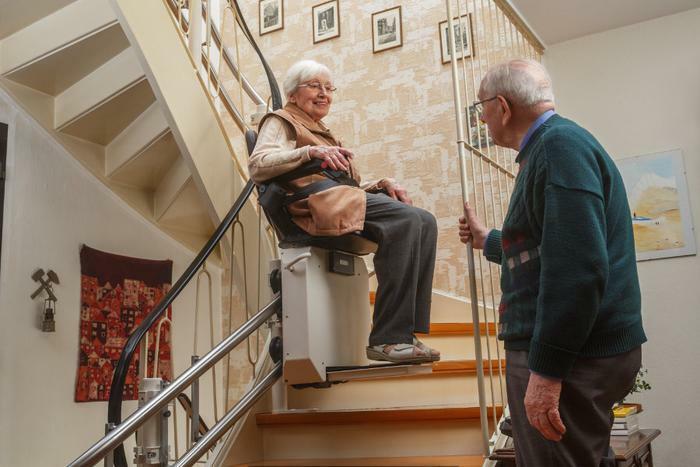 A stair-lift eases the problem of dealing with stairs and is inexpensive to install. Retrofitting at least one entry to the home so that it is entered from a level surface can be costly, but it can also add to the occupant's quality of life. Accidents can happen, even in the most elder-friendly environment. That's why many older people living at home alone subscribe to a home security service that provides a medical alert pendant. This wearable device can connect the wearer with an operator in the event they fall and cannot reach a telephone to summon help. It not only provides peace of mind to family members, it's a practical way that older people can safely remain in their homes for years longer.